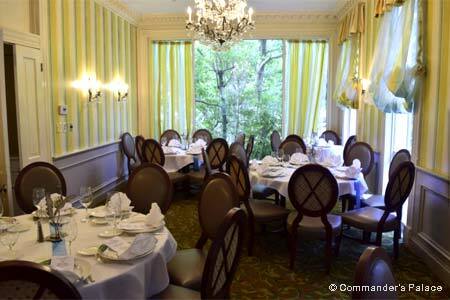 Elegant Commander’s Palace offers contemporary Creole cuisine in the Garden District. : From the turquoise exterior to the interior’s lush Southern-style dining rooms, Commander’s Palace defines elegance. Owned by the high-profile Brennan family, the restaurant serves contemporary Creole cuisine that’s as exemplary of the genre as any that can be found in the Gulf South. Signature dishes include turtle soup with sherry, Parmesan-crusted oysters and a bread pudding soufflé, and these are just the tip of the culinary iceberg. Chef Tory McPhail offers a pecan-crusted Gulf fish with Champagne-poached jumbo lump crab, and a black skillet-seared wild fish with vegetables and char-grilled Meyer lemons, herbs and brown butter vinaigrette. His Creole-spiced veal tenderloin is slow cooked with a Creole mustard demi-glace, while a tender osso buco is finished with a rich roasted lamb bone jus. Among desserts is a unique cheesecake made from Creole cream cheese. The libations list is extensive, with depth in many areas, including fine vintage portos, Cognacs and Scotch whiskey. Here's where you want to have that Sazerac, a classic New Orleans cocktail. Service is as good as it gets in New Orleans. Try to score a table in the Garden Room.